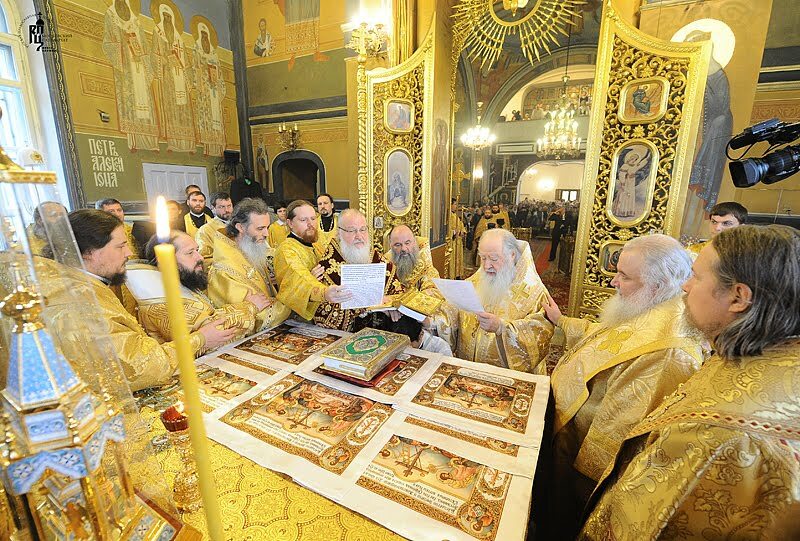 At this morning's Sunday Liturgy in the Muscovite district of Strogino's newly consecrated Church of the Dormition Patriarch Kirill (Gundyayev) of Moscow, Metropolitan Ambrose (Zographos) of Seoul of the Constantinopolitan Orthodox Church, and seven hierarchs of the Russian Orthodox Church concelebrated the consecration of Bishop-elect Theophan (Kim) to the episcopacy as Bishop of Kyzyl and the Orthodox Church in Tyva. Axios! Although a native of the Russian Far East, Bishop Theophan previously served in Seoul under the Ecumenical Patriarchate's South Korean metropolis and is the first ethnically Korean hierarch of the Orthodox Church worldwide. More (in Russian) on the consecration can be found here.